As part of an official delegation spearheaded by Kenya-based KANCO and co-sponsored by UNAIDS, the UN Office on Drugs and Crime (UNODC), and the International HIV/AIDS Alliance, twenty-two representatives of East African governments, UN agencies, and non-governmental organizations traveled to China in early July to learn more about innovative approaches to HIV prevention among people who use drugs. The trip was originally conceived of more than two years ago when a small group of Kenyans, who were part of the Eastern Africa harm reduction multi-country program supported by the Global Fund, learned about a new take-home methadone program being piloted in China. The delegation was composed of a mix of county leaders from Kenya, representatives of the national governments of Kenya, Tanzania, and Uganda, and UNAIDS country directors from Kenya, Uganda, and China, East and Southern Africa regional UNAIDS and UNODC personnel, staff of KANCO and the International HIV/AIDS Alliance (AIDS Alliance), and this GFO correspondent, who documented the trip. The formal leader of the delegation was the Deputy Governor of Lamu County in Kenya, Mr. Abdul Hakim Bwana. Much of the in-country coordination was managed by the National Center for AIDS/STD Control and Prevention (NCAIDS), a unit of the China Center for Disease Control and Prevention (China CDC), with assistance from the UNAIDS China country office. The KANCO multi-country grant (QPB-H-KANCO) which began in October 2015 and will end 30 September 2018, was established in order to strengthen networks of people who use drugs and the harm reduction policy environment, and improve strategic information generation about people who use drugs in the region. The $5.6 million program targets the following countries: Burundi, Ethiopia, Mauritius, Seychelles, Tanzania, Uganda, Zanzibar, and Kenya, where it is hosted by Nairobi-based KANCO. One of the underpinnings of the KANCO grant is that harm reduction programs in Eastern Africa are nascent but the need is growing, as populations of people who use drugs expand and key populations account for a growing proportion of HIV incidence in the region. The multi-country program was arguably designed to do exactly what the Fund looks for in regional programs: to provide regional-level advocacy scaffolding for under-prioritized programs that are funded through country grants. Financing for the group’s trip to China was mostly mobilized by the AIDS Alliance, via its Capacity Development Fund, which is intended to support learning and exchange between the Alliance’s “linking organizations.” KANCO and AIDS Care China are both such linking organizations. Additional funding was provided by UNODC, which participated in the trip. And while only a very small portion of the funding for the China visit was financed through the multi-country grant, the concept was spawned, cultivated, and operationalized through the regional collaborations which have been supported by the grant. The use of methadone by people who use drugs is an important technique for HIV prevention in these populations, as it allows patients to manage their addiction without the need to use heroin intravenously. Injection drug use is a major driver of HIV in some communities due to the common practice of sharing syringes, through which HIV can be efficiently transmitted from one user to another. Methadone, which taken daily, is typically administered to patients in a clinic setting, under the supervision of clinic personnel, because it is a controlled substance. The daily trip to a clinic can be a barrier for many people trying to kick a heroin addiction and protect themselves from HIV infection, and thereby can limit patient compliance and the overall impact of methadone programs. But in 2013 in Yunnan Province, located in southwest China, the local health authorities began giving some methadone patients secure, internet-connected boxes with up to four days’ supply of methadone to take home. The high-tech take-home boxes allow patients to reduce the number of trips to the clinic, giving them more time to attend to other aspects of their lives. Because of this, take-home methadone can improve patient compliance and outcomes. Take-home methadone has been a long-sought approach for many patients and providers, in China, Africa, and elsewhere, but has proven to be difficult to implement due to legal restrictions and the inherent street-value of the opioid substitute. Injection drug use is on the rise in Eastern Africa, and health systems are struggling to make methadone accessible in ways that meet patients’ needs and are also sensitive to legal and cultural realities in the region. 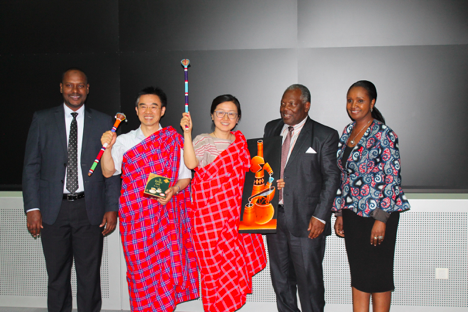 Dr. Musyoki quickly teamed up with colleagues from KANCO, and they began exploring how to arrange an opportunity to travel to China and see first-hand how this innovative approach to take-home methadone maintenance therapy (MMT) worked. They found that such a visit needed to be initiated by a government-to-government communication, and that the UNAIDS family would need to be brought in to help facilitate. After more than two years of planning, official communiques, and the building of a multi-country delegation, the visit finally came to pass from 1-6 July 2018. After a day of meetings with high-level government officials in Beijing, the entire delegation traveled to Kunming, the capital of Yunnan Province. The province borders Myanmar, Vietnam, and Laos, and has direct access to Thailand and Cambodia via the Mekong River. The area where these countries all meet is sometimes referred to as the ‘Golden Triangle,’ because of its history as a major opium production center. For much of the 20th century most of the world’s opium originated in this region. Yunnan’s direct proximity to the Golden Triangle makes it a primary entry point in China for heroin and heroin users from neighboring countries. It is for these reasons, and key recent innovations, that it was determined that the delegation should visit Yunnan. Over two and half days, the delegation traveled around Kunming and a smaller city, Yuxi, to meet with leaders and see first-hand how programs are being implemented. The most notable local innovation is the take-home MMT program, which relies on “intelligent medicine chests” (IMCs) and associated software. The IMCs were developed through a partnership between the Yunnan and Yuxi Centers for Disease Control and Prevention, the Yunnan Institute for Drug Abuse (YIDA), and a team of engineers. The IMC design went through several prototypes before its current form was established and manufactured. The current IMC is a hard-cased silver box which contains four doses of methadone; one dose per day, meaning four days’ supply for a patient. The doses are delivered orally by ingesting a pink liquid, as all methadone in China as. Each dose is enclosed in a locked section of the box. On each of the four days patients are able to open one dose. Doses are accessed either by receiving a key code on their mobile phone, or by applying their fingerprint to a sensor on the box (there are two models in circulation). Patients can access a given dose as many times as they want between 6:00am and 10:00pm on the designated day, at which point it self-locks again. Once the patient has used all four days’ doses, they return to the clinic to get a refill. All the while, patient compliance is monitored by software used by the methadone clinic staff. The IMC, which is the centerpiece of the take-home MMT program, costs roughly $800 to produce. The take-home MMT program was fully launched in January 2017. According to YIDA, “By April 2018, 500 patients had been qualified for the take-home treatment, of which 39 patients (8%) lost this privilege later due to voluntary quit, death, insufficient credits and other reasons.” Further details about the take-home MMT program will be discussed in a follow-up article in GFO later this year. The delegation spent about an hour at the MMT clinic where the IMCs were first piloted, in the Hongta District in Yuxi City. There the delegation was able to view the various IMC prototypes, put their hands on the them, learn about their functioning, and receive a tutorial on how the IMC management software works. By and large, the delegates were fascinated by the IMCs. The high-tech boxes were the principal inspiration for the China trip and they did not disappoint. Because of the tight itinerary, delegates had to leave the MMT clinic long before they were finished asking questions of the staff and inspecting the prototypes. With the official visit behind them, replete with all its field visits, official forums, and banquet dinners, the delegates are setting out to determine the feasibility of take-home MMT in their own countries. In addition, they want to prepare priorities for their national delegations to the upcoming Forum on China-Africa Cooperation Summit, to be held in Beijing in September of this year. The Summit will be the seventh of its kind, but first since the 2015 edition was held in Johannesburg. At that meeting Chinese President Xi Jinping announced a tripling of his country’s financing commitments in Africa, totaling $60 billion, and launched his ten-point plan for cooperation. While commerce tends to be the primary focus of these summits, aid and investments in health and infrastructure are also discussed. Armed with their own intimate understandings of what could be possible through cooperation with Chinese health officials, the African delegation members are already working on drafting health-related priorities for their governments to carry forward at the 2018 meeting. Being that UNAIDS and UNODC were deeply engaged with the China trip, they will work alongside the Kenyan, Tanzanian, and Ugandan participants in articulating salient priorities for the Summit. But regardless of what course of action the delegates determine is best in their countries, they will not be able to carry it forward with the support of the multi-country grant. Much to their chagrin, the KANCO multi-country grant will end this year and will not be eligible for renewal. Earlier this year the Global Fund announced—and Aidspan reported—that it would be discontinuing multi-country grants in Sub-Saharan Africa when the current ones expire. As was described in that GFO article, many people, including Shaun Mellors of the International HIV/AIDS Alliance—who participated in the China trip—were dismayed by the Fund’s decision, claiming that it removes an important tool for combating HIV in Africa. “It is definitely not possible or appropriate for national grants to cover regional activities or processes. This is becoming an excuse not to fund regional advocacy and policy work,” said Mellors when interviewed for the previous article. Editor’s Note: Aidspan wishes to express our thanks to the delegation and to the International HIV/AIDS Alliance for welcoming and facilitating our correspondent’s participation in and coverage of this historic exchange.